I think it is grave to kill men, under the pretext that they are mistaken on the interpretation of some point, for we know that even the chosen ones are not exempt from sometimes being wrong. Michael Servetus (29 September 1511 – 27 October 1553) was a Spanish theologian, physician, cartographer, and humanist, renowned in the history of several of these fields, particularly medicine and theology. He participated in the Protestant Reformation, and later developed a nontrinitarian Christology. Condemned by Catholics and Protestants alike, he was arrested in Geneva and burnt at the stake as a heretic by order of the Protestant Geneva governing council. Michael Servetus, alone, but trusting in Christ’s most sure protection. Poor people always lose in struggles. Inherent of human condition is the sickness of believing the rest are impostors and heathen, and not ourselves, because nobody recognizes his own mistakes … If one must condemn everyone that misses in a particular point then every mortal would have to be burnt a thousand times. The apostles and Luther himself have been mistaken … If I have taken the word, by any reason, it has been because I think it is grave to kill men, under the pretext that they are mistaken on the interpretation of some point, for we know that even the chosen ones are not exempt from sometimes being wrong. I have seen with my own eyes how the pope was carried on the shoulders of the princes, with all the pomp, being adored in the streets by the surrounding people. Such considerations were reinforced when he attended the coronation of Charles V, Holy Roman Emperor by Pope Clement VII, and witnessed the Pope, seated on his portable throne, receive the king, who kissed his feet. In the Bible, there is no mention of the Trinity… We get to know God, not through our proud philosophical concepts, but through Christ. At the age of 20, he published On the Errors of the Trinity, a work that made him a principal target of the Inquisition. I do not agree or disagree in everything with either one party or the other. Because all seem to me to have some truth and some error, but everyone recognizes the other’s error and nobody discerns his own. While in prison, Servetus signed his last letter with these words. To kill a man is not to protect a doctrine, but it is to kill a man. The Spaniard, Servetus, contends in his tract that there is but one person in God. The Roman church holds that there are three persons in one essence. I agree rather with the Spaniard. Servetus’s death was the turning point in the ideology and mentality dominating since the fourth century. 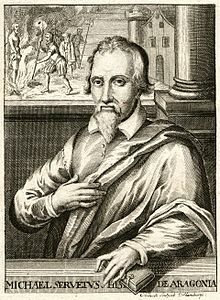 From a historical perspective, Servetus died in order that freedom of conscience could become a civil right of the individual in modern society. Michel Servet[us], . . . geographer, physician, physiologist, contributed to the welfare of humanity by his scientific discoveries, his devotion to the sick and the poor, and the indomitable independence of his intelligence and his conscience … His convictions were invincible. He made a sacrifice of his life for the cause of the truth. Michael Servetus Research Website with quotes and documents of Servetus's work and biography. “On The Errors Of The Trinity” Excerpts from the book. This page was last edited on 16 February 2019, at 11:27.